A Green Mushroom: How Do I Get My Girlfriend to Play Video Games? 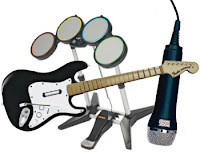 The answer, my friends, is Rock Band. If you want to know how to game with girls there is something you should know. Rock Band is a gateway game. It opens girls up to the possibility that the video game consoles may actually hold something of interest for them. The key here is that all girls sing. 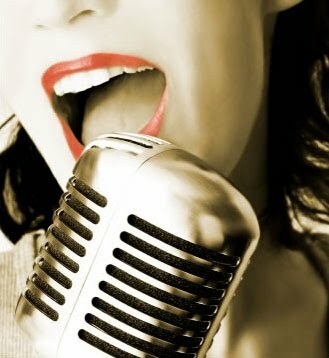 Whether they sing at parties, in the shower, or top-of-their-lungs in the car, they most definitely sing. Give that girl a microphone and she's ready to go. No need to explain the scrolling notes, star power, song ratings, or anything really. The girl just wants to sing. Let her. Next step, wait. Something magical may happen. After seeing you play guitar and drums in her peripheral vision she may - one day - ask to try it. This is when you know you have won. The gateway is open. Now it is time to add more games to the mix. I'll write more about that soon. My trick was equally simple: my wife loves Mario Kart and Kingdom Hearts. She loves Lego games, too. I was able to get her to play anything that we could do together or that I could sit and watch her and be just as interested in. Now, she's moved past that, but it seems that collaboration was the key to introducing that non-gamer into our lifestyle. Collaboration makes a huge difference. Now that I think about it, almost every game I have my fiance hooked on can be played collaboratively. Rock Band, Mario Kart, Team Fortress 2, and a bunch of tower defense games that we enjoy watching while the other person plays.